In Notations Cage assembled a collection of music manuscripts benefited to the Foundation for Contemporary Performance Arts, New York. The archive began to map the changing direction(s) of graphical representation in music practices. In honour of Cage's ambitious research project, participants of Notations 2008 addressed accepted notions of composition and performance - at the centre of which lies the seemingly fundamental musical score. 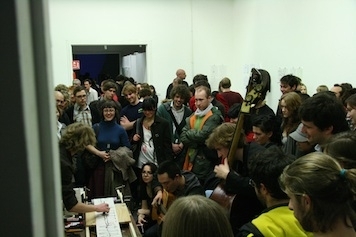 Notations 2008 was a creative laboratory providing a platform for leading artists to negotiate shifting relationships between the visual and the audible. The event culminated in performances with contributions from leading contemporary musicians, including Anton Lukoszevieze from Apartment House and emerging percussion talent Sankorfa. These musicians were accompanied by a significant body of artists from the Slade School of Fine Art as well as invited performers from across the UK.